If you’re like me whenever you hear the word Vegan your ears shut off; “No thanks, not for me, where is the nearest hamburger?” So, when I find a vegan recipe I can actually get behind, it’s kind of a big deal. I’ve already written about my favorite chocolate cake, the mighty chocolate cake, which happens to be vegan. What I love about this cake is that when you taste it, the first thought through your head isn’t “not bad for vegan,” it’s; “man, that was good!” I had the same reaction the first time I tried this lasagna. The the vegetable filling was prepared in such a way that it was creamy and spicy and I didn’t even miss the cheese! *Note in the lovely photo above I accidentally included chili powder rather than crushed red pepper flakes, though chili powder is a fine substitute, if you have the red pepper flakes go with that. Before we get started, I just want to say this ain’t pretty. But trust me. Trust me! It is delicious and I would not lead you astray. 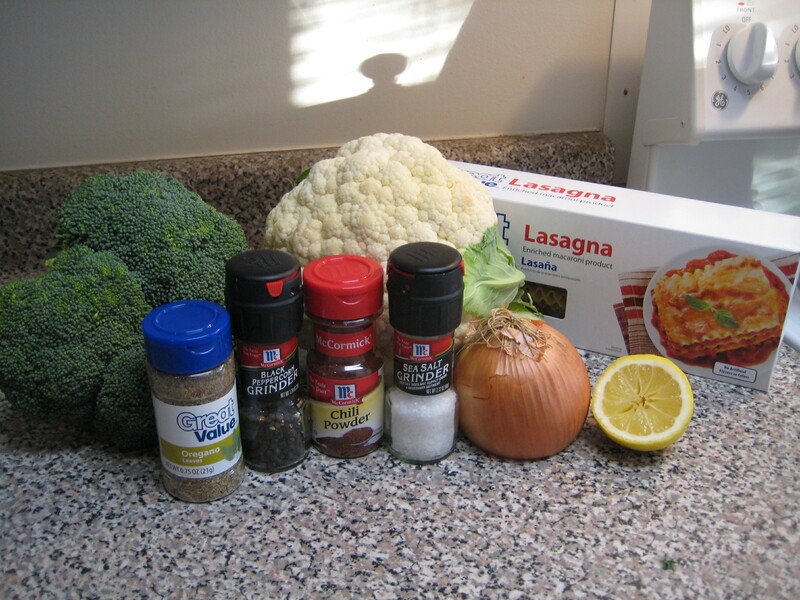 First start by loosely chopping the broccoli, cauliflower, and the onion. Don’t worry about how large or small the veggies are because they are all going to end up in a blender or food processor eventually. Next pour the 2 cups of water, the veggies, all spices, and the lemon juice into a large pot. Cover the pot and cook on high heat for 20-25 minutes. 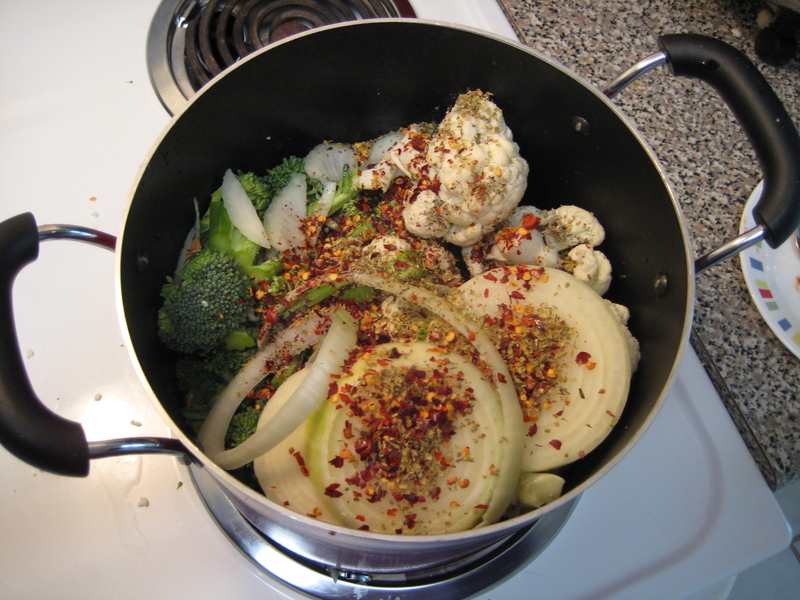 Check on your veggie mixture after 15 minutes to make sure there is still water in the pot. This is important because if all of the water cooks off your veggies could burn, and your kitchen will stink like all get out. Lesson learned, burnt broccoli does not smell great. 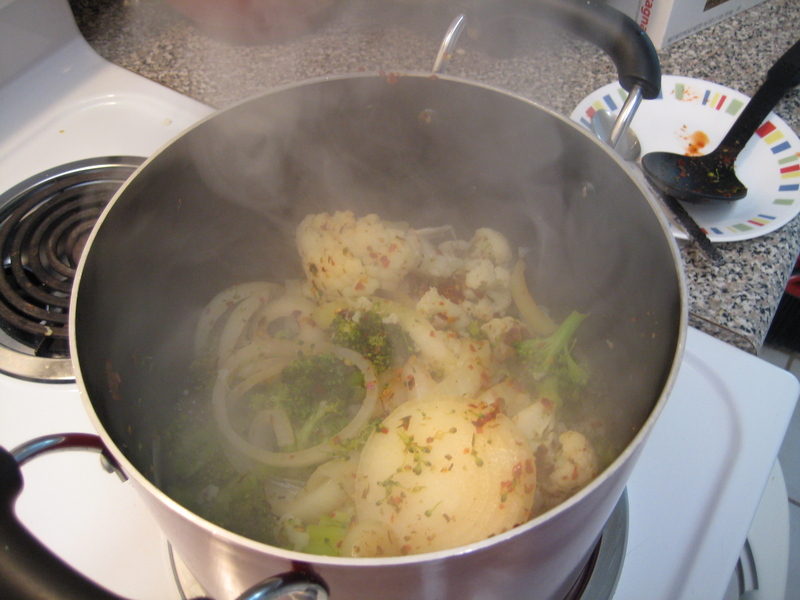 After 20-25 minutes of cooking there should be a small amount of water left at the bottom of the pan and the broccoli and cauliflower should be mushy. Next, carefully transfer the veggies to a food processor or a blender. Puree the mixture until it is a smooth texture. This is a good point to taste the mixture and adjust the seasonings if need be. Once the mixture has been pureed and seasoned to the desired taste put the mixture in the refrigerator to cool. Next, prepare the lasagna noodles following the instructions on the package. After they have been cooked and strained it is time to assemble the lasagna. This recipe makes enough for a large 9×13 pan or 2 8×8 pans. 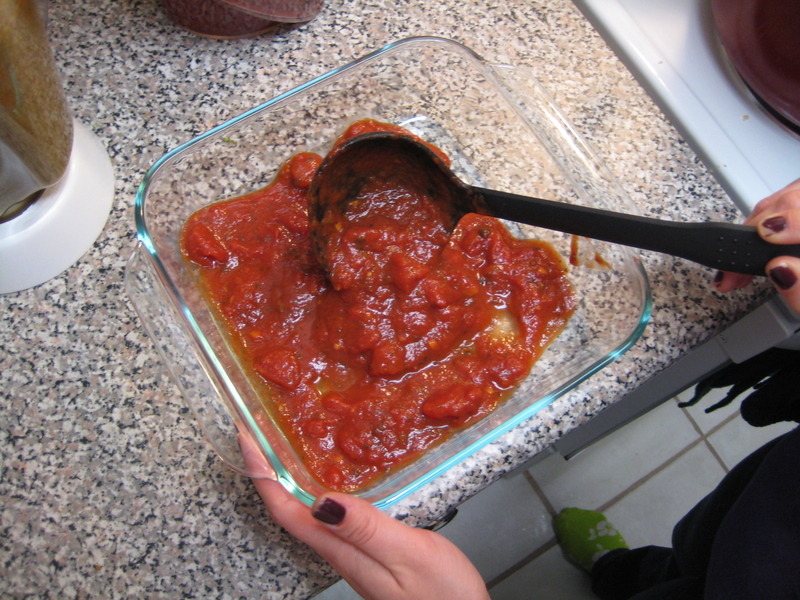 To assemble this lasagna start with a thin layer of sauce at the bottom of the pan. Next add a layer of noodles to cover the layer of sauce. Then add a layer of the veggie puree, spreading the mixture across the noodle layer with a spoon. I told you, this ain’t pretty, but stay with me! 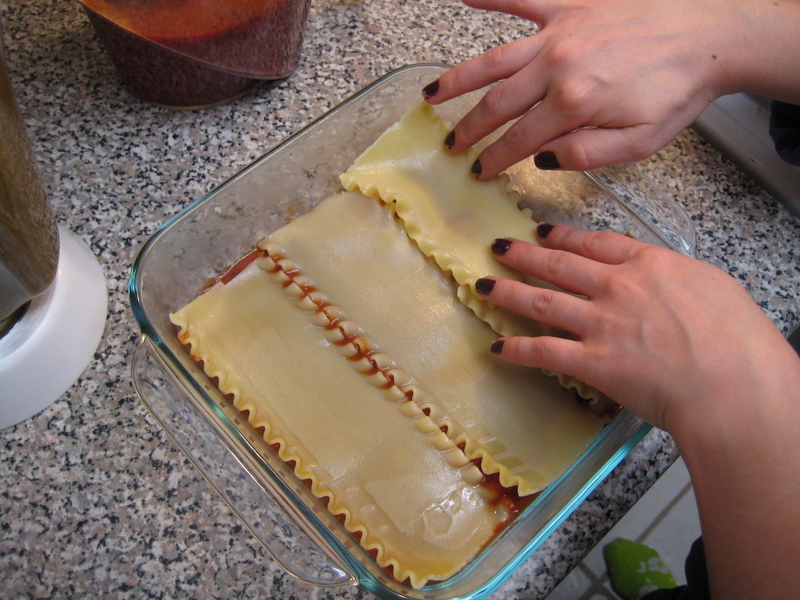 Be careful not to make your layers too thick, or else you will get a very sloppy lasagna. After the layer of the veggie puree add a thin layer of sauce. Lastly add another layer of noodles. Continue to layer the pan in this sequence until the pan is full; veggie puree, sauce, and noodles. (The very last layer should be noodles) I would recommend trying to get 5 layers of noodles in your pan. Cover the pan with foil to prevent the noodles from drying out or burning and bake for 30-40 minutes. 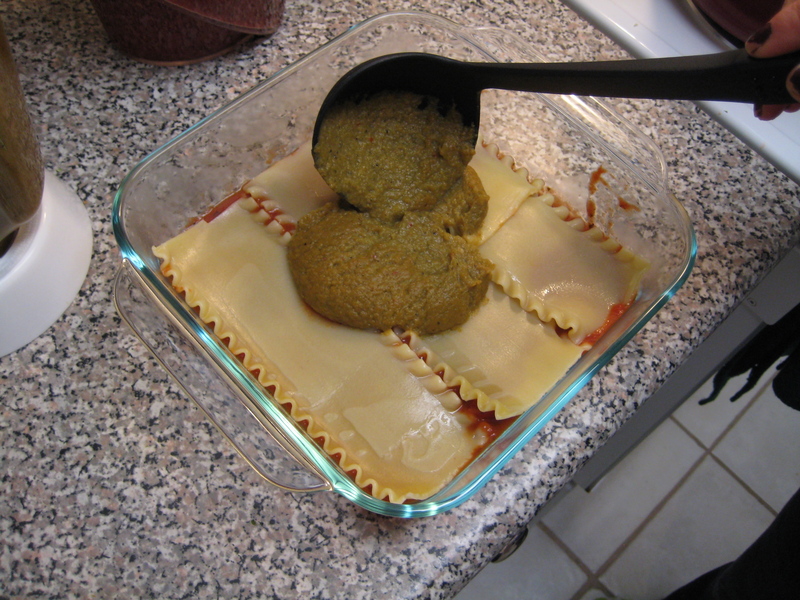 The lasagna is finished when it has been heated all the way through. I told you, it ain’t pretty but give it a try, I don’t think you will be disappointed. 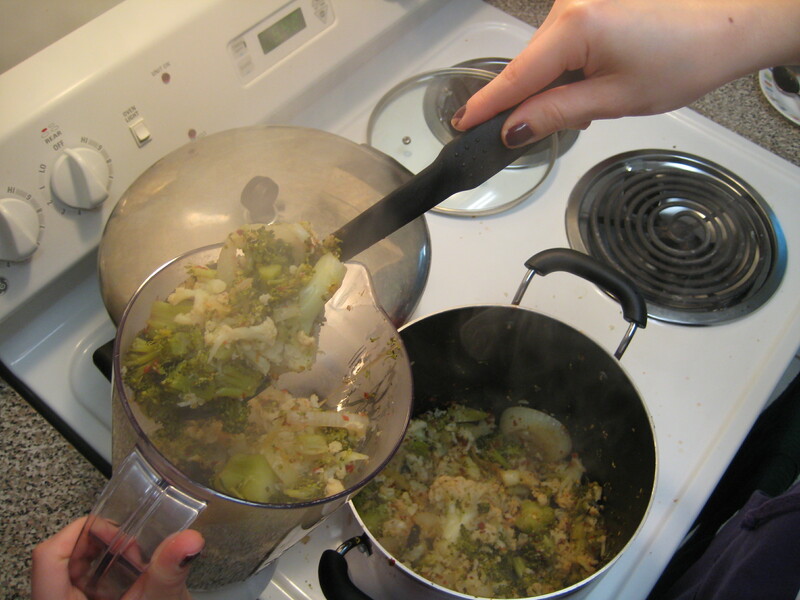 Check on your veggie mixture after 15 minutes to make sure there is still water in the pot. This is important because if all of the water cooks off your veggies could burn, and your kitchen will stink. Preheat the oven to 350 degrees. 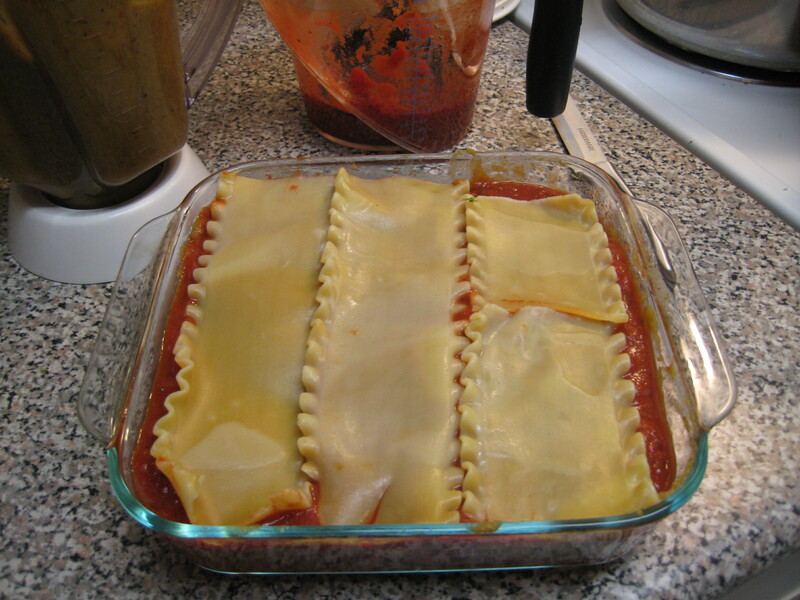 To assemble this lasagna start with a thin layer of sauce at the bottom of the pan. Next add a layer of noodles to cover the layer of sauce. Then add a layer of the veggie puree, spreading the mixture across the noodle layer with a spoon. 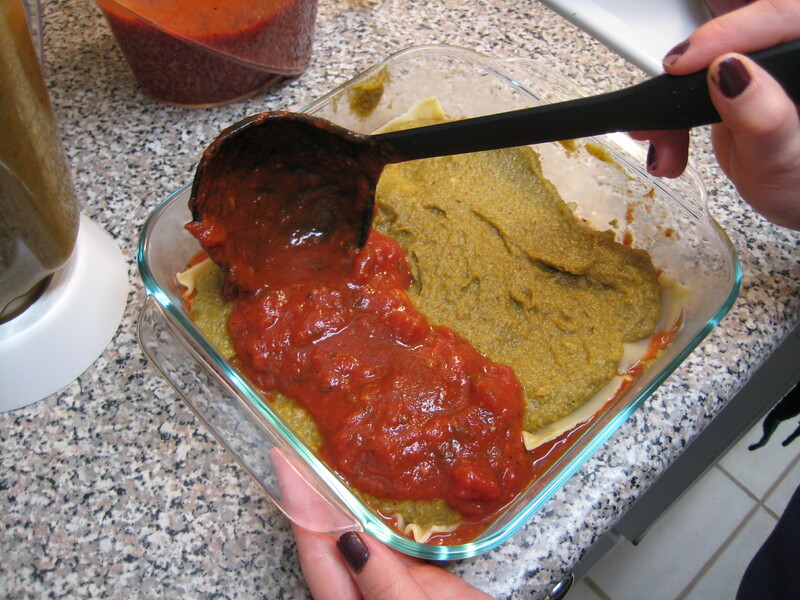 After the layer of the veggie puree add a thin layer of sauce. Lastly add another layer of noodles. Continue to layer the pan in this sequence until the pan is full; veggie puree, sauce, and noodles. (The very last layer should be noodles) I would recommend trying to get 5 layers of noodles in your pan. 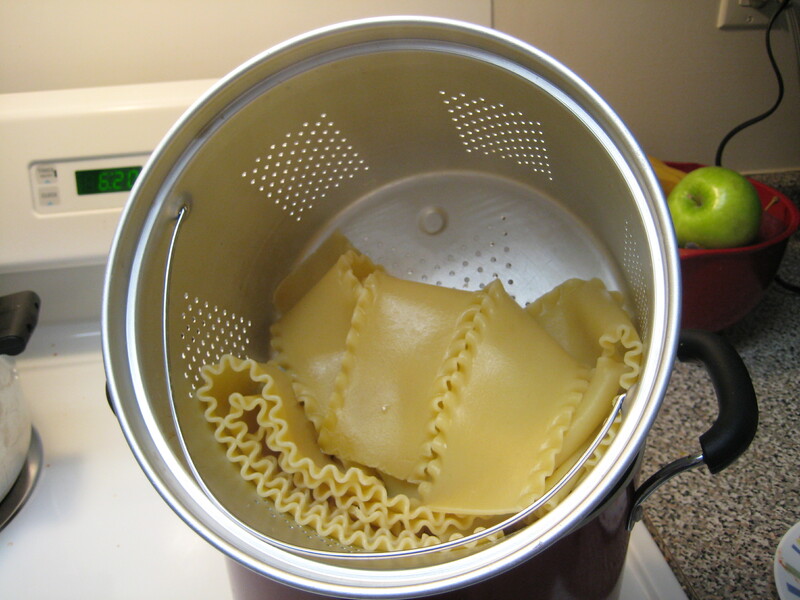 Cover the pan with foil to prevent the noodles from drying out or burning and bake for 30-40 minutes.